The latest version of the Cornilleau Performance 500M Crossover has a new design and much bigger wheels. This helps when transporting it over gravel. It also benefits from a Mat-Top finish (which reduces glare by ten times). 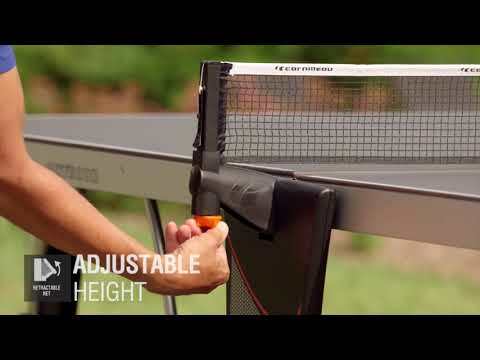 It has excellent weatherproofing, a very clever net with height and tension adjustment which automatically folds away as the table closes and re-appears when you unfold it. This protects the posts from being broken by a football etc. The 500M also has a neat, tidy storage position and benefits from the industry's quickest and safest folding system and comes with a ten year warranty. The legs and frame are very strong and it has good quality wheels (two of which have brakes). There’s a storage area for bats and balls, padded corners, leg levelers, a ball holder under the table at each end (so you can store a spare ball there when you’re serving), and an ‘easy-track’ handle to pull it along by.